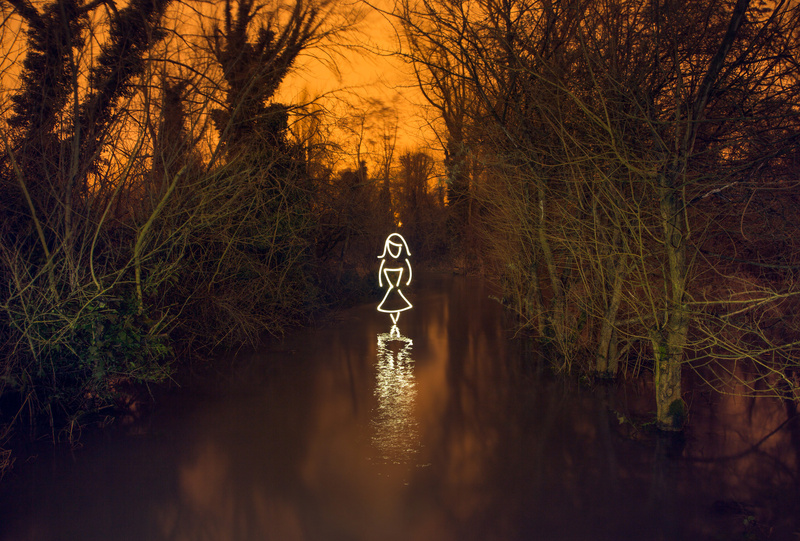 Light painting (all hand drawn, all in camera) in the flooded River Colne. Somewhere about two feet beneath the water is a footpath, but the whole week the local “Aquadrome” has been doing its best to live up to its name. The orange glow is from sodium vapour light pollution. Perhaps I overly flashed the trees in this shot, but I think the central figure still has presence. With the pinup girl figure now becoming something I can draw reliably, I’m looking to upgrade my skills with other figures and more complex surrounds. Hope you can live with this simple one for the time being though.